Jason P. Haddix originally from rural Illinois, now lives and works in Ft. Collins, Colorado. He has been both fly fishing and tying flies for quite a long time. 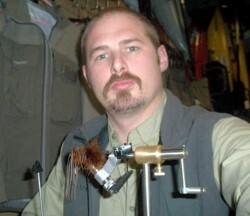 Jason guides, teaches lessons and works in the shop at Angler`s Roost Fly Fishing Company. In addition to his duties at Angler`s Roost Jason also spends a great deal of time working to promote both fly tying and fly fishing, as well as working with kids to ensure the future of the sport. When he`s not busy with one of those he can be found tying up and testing new fly patterns for the waters at home or across the country. Jason also finds time to run his own tying buisness called On The Fly-Custom and Production Fly Tying. The business focuses on high quality industry standard patterns as well as tying specialty patterns for clients. Through On The Fly he also markets some unique tying materials, as well as some hand made tying tools. Jason also teaches private fly tying lessons, for people who want that one on one feel and not the group atmosphere. When he`s not busy with one of those, he`s out on the road tying at shows and giving tying demonstrations at small shops. Also keep your eyes out for some tying manuals and a fly tying book to be published by Jason in the future. If all of that wasn`t enough to keep one guy busy, Jason is also a part of Peak Rotary Vises Pro Staff, T.L. Johnson Fly Rods Pro Staff and of course Daiichi Hooks Pro Staff. All in all if it has to do with fly fishing or tying, you`ll find Jason there.